Sign on up as a user and chat along with us. There are also crops and challenges going on all the time to inspire you to create scrapbooking layouts of all sorts!! We celebrated B's 3rd B-Day at the end of May with a Pirate themed party. I made the cake! 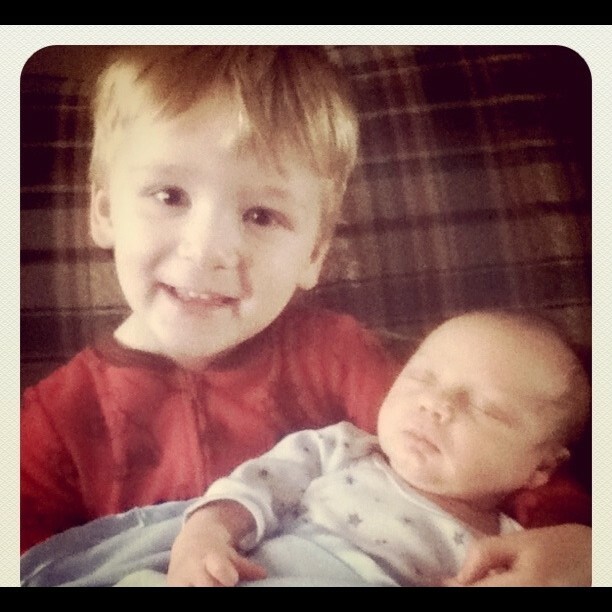 Snuggling brothers...B LOVES being a big brother and wants to hold E whenever he can. B and his buddy-since-birth Ben at the Princeton Splash Pad! Ben's mom and I were in Childbirth class together, due around the same time and we both had our boys a month early. It's been so much fun to watch the boys grow up together! Oh so busy with 2! Me and my boys...I set up my tripod to get this picture of me taken with the boys. Sometimes a mom's gotta do what a mom's gotta do! A couple of weeks ago, we had my sister and her kids up to play and meet Elliott. It was great fun watching B, Layney and Liam all playing together and Layney LOVED holding her baby cousin! On Sunday we took B out to fly his first kite. It was the perfect weather for it and we all had a blast. That's my quick update for today. Gotta get B outside to enjoy this BEAUTIFUL weather!